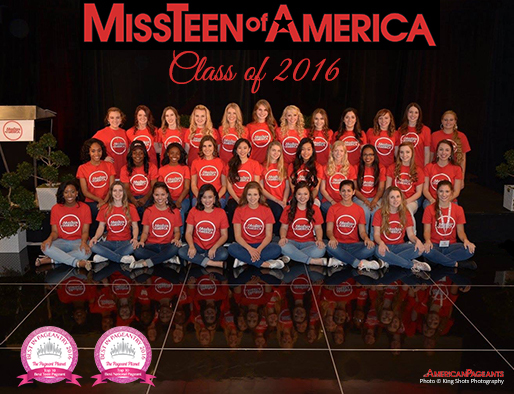 Miss Teen of America was the first national title ever awarded by the American Pageants family of programs in 1983. The Pageant was designed specially to provide recognition in a positive setting. It also provides the opportunity for growth and development. In short, the event is a significant step to encourage continued success as a young adult. It recognizes girls who rank high academically or who have been acknowledged for their leadership abilities, personal achievements or accomplishments. The pageant’s six judging categories are designed to provide a fair judging format which focuses on achievement. The event includes fun, friendship, and memories to last a lifetime! As you discover more about American Pageants, we hope that you will discover the positive influence that being a part of the organization will have on you and your future endeavors. We welcome you to come and experience our program for yourself! Participants must between 16 and 18 years old as of January 1 of year of competition. Participants must be a resident of the United States and have a residence or attend school in the state she is representing. Participants must never have been married, have had a marriage annulled, or have been pregnant. The participant who wins the state title will represent the state at the National Pageant. In the event that a State Titleholder is disqualified or chooses to relinquish her title, another candidate can be chosen to compete at Nationals in her place. State Titleholders must commit to continue to the next level of competition or forfeit her title and prize package.